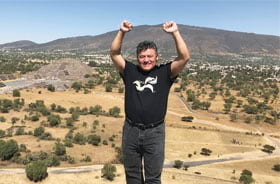 Daniel Munoz, the GIS manager for Orange County, New York, lets his community mapping T-shirt shine atop the Pyramid of the Sun in the ancient Mesoamerican city of Teotihuacan, Mexico. 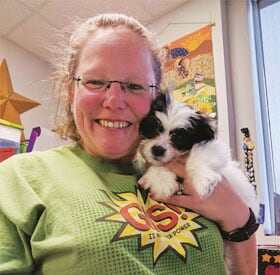 In Binghamton, New York, 4-H program coordinator Kelly Adams gives her GIS superpowers a bit of a break to give Rizzo, the office therapy pup, a quick snuggle. 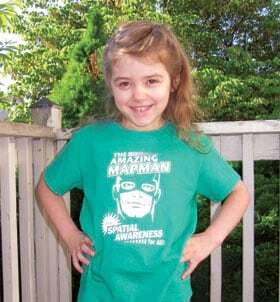 Making her way across all 50 US states, geography student Sophia promotes spatial awareness for all!